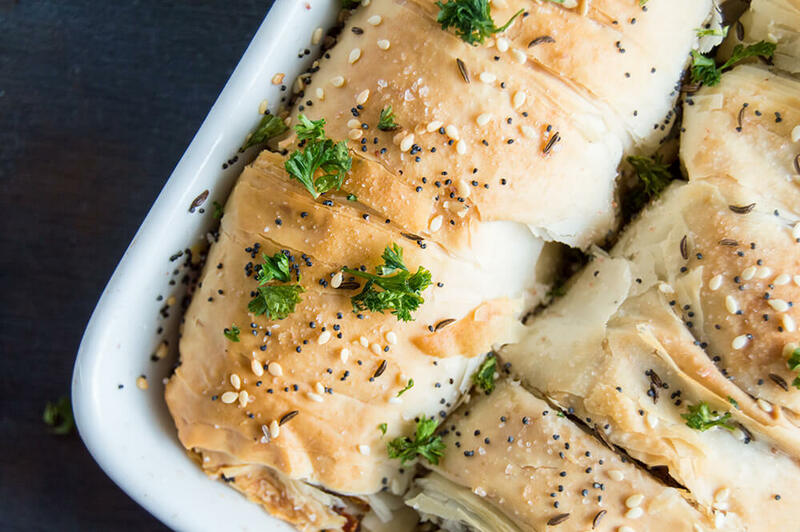 Burek, or börek, is a super traditional Balkans dish that can be enjoyed for breakfast or a late night snack. While I may have never had the real thing, the recipe I based mine off of claims to be authentic. I'm just kidding, I can't read anything that website says. But whether or not my version is actually super close to the traditional recipe, the end result was still beyond delicious. 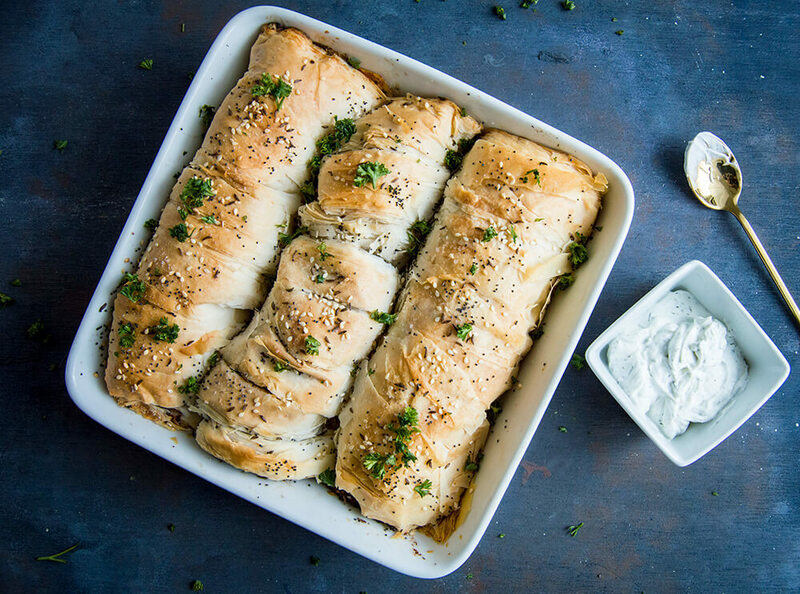 Most borek, like the one in this recipe, is served fast food style and sometimes stuffed with feta cheese and spinach in addition to beef. The way I made mine was pretty simple. I first made the filling and let it cool while the phyllo dough thawed. Once the phyllo was soft enough to unroll, I spread the filling down the center and then just rolled it up like a burrito. I served mine with a very, very simple tzatziki made from Greek yogurt, a squeeze of lemon and dill. In a large skillet over high heat, brown the beef until crumbly. Strain and rinse the beef and set aside. Wipe out any chunks from the skillet, but leave some grease. Return the skillet to the stove over medium high heat. Saute the onions and peppers until tender. Add the cooked beef back to the skillet. Season with salt and pepper. Stir in the dill and beef base powder. Remove from heat then stir in the feta cheese, if using. 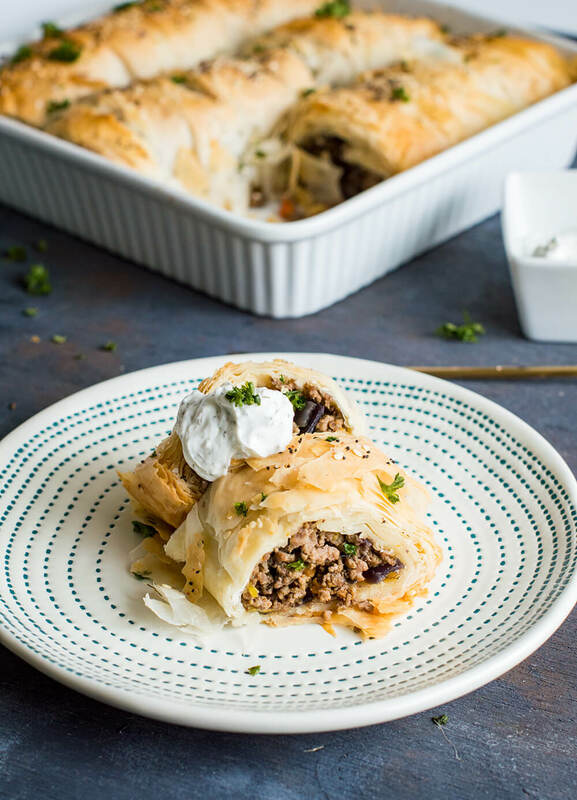 Let the beef mixture cool while thawing the phyllo dough. 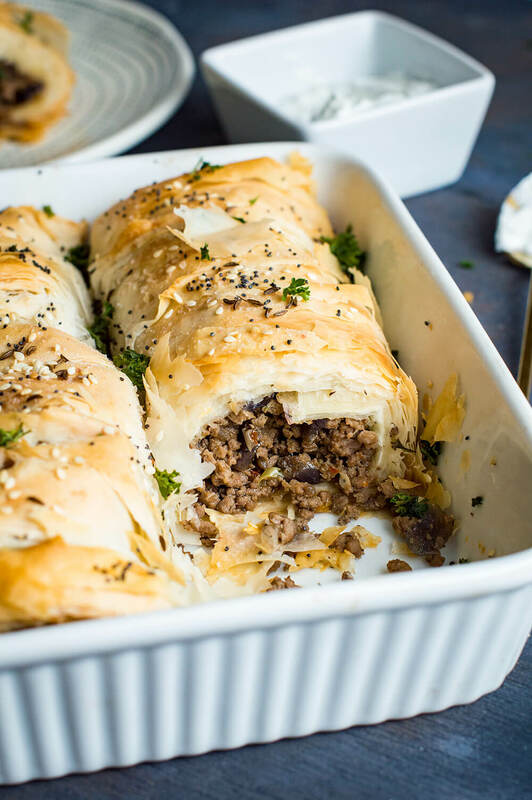 When the phyllo dough can be easily folded, spread the beef mixture down the center. 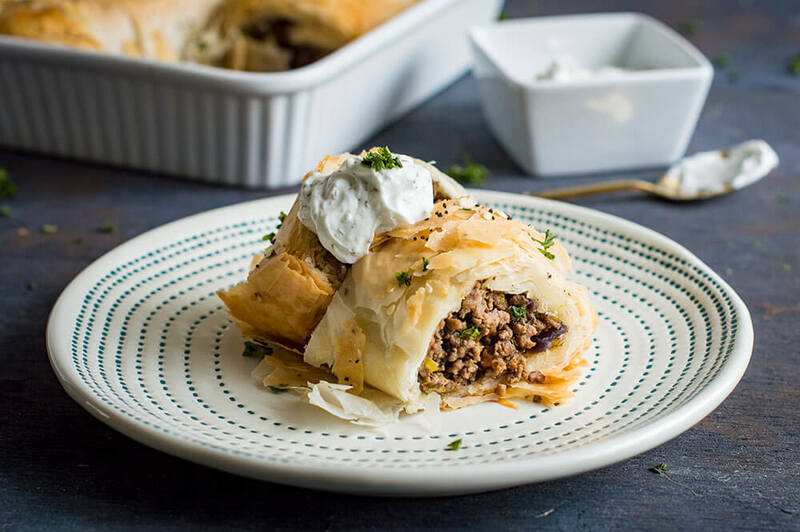 Carefully wrap one side of the phyllo over the top of the beef and continue to roll until the phyllo forms a 'burrito' around the beef. Grease a baking dish with cooking spray. Place the wraps side-by-side - you may have to cut the wrap in half to make it fit properly, depending on what size your baking dish is. Mine was 9x9 square for two full sheets, one cut about in half. Brush the tops of the phyllo wraps with the olive oil. Sprinkle on the caraway seeds, sesame seeds and poppy seeds, as desired. Bake for 20-30 minutes, until the burek is golden brown and cooked through. Garnish with fresh parsley ands serve with a side of simple tzatziki sauce. Enjoy!